LIBERAL, Kan. – For the second time this season, sophomore Luz Sierra has been named an NJCAA Player of the Week, this time for her offensive showing. Two weeks ago, Sierra earned the NJCAA Defensive Player of the Week award. This marks the third NJCAA National Player of the Week award won by a Lady Saint, as Giovanna Tapigliani won the award earlier this season. 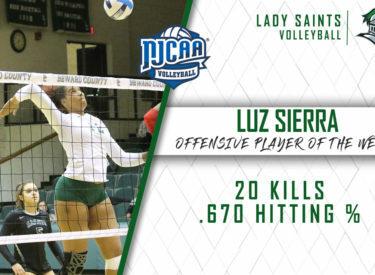 Luz Sierra had a great week, coming away with 20 kills on 30 attempts while finishing with zero attacking errors. She hit an astounding .706 against Garden City and .615 against Hutchinson. Sierra is hitting .480 on the season, while averaging 2.58 kills per set. On the defensive end, she finished with three solo blocks , finishing with 26 points for the week, helping lead the Lady Saints to sweeps over the Trojans and Blue Dragons. Seward will look to stay perfect in conference play tonight as they take on 3rd-place Barton at 6:30 p.m. in the Greenhouse.